Find other financial advisors and firms to reach your succession and growth goals. Get matched and network on our self-serve platform. Receive expert advice and white glove service. Our consultants will crystalize your vision into a customized action plan designed to help you meet your goals. We match financial advisors and advisory firms. Choose between a low-cost or high-touch service. Network on our self-serve platform or engage a Concierge Consultant to navigate you to your succession and growth goals. Use our guided questionnaire to build a portrait of your firm and its goals. Sort and filter your Match List to refine your choices. Send messages to communicate directly with your matches. 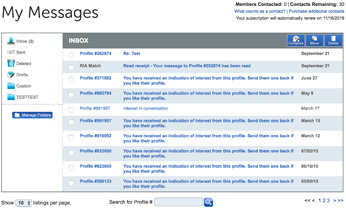 Thousands of advisors and firms come to RIA Match to search for free and pay to connect anonymously and securely. Read curated and organized industry articles in the Knowledge and Insight Digest. Watch our in-depth webinars to gain professional insights on valuation, growth and M&A. Gain a deeper understanding of the solutions for succession planning and growth in our blog. 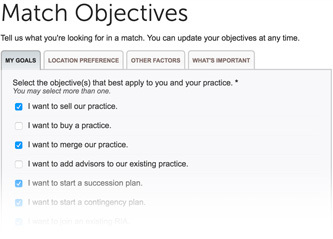 Visit the RIA Match Store to access solutions shared by Subject Matter Experts. Use our easy-to-follow wizard to describe you firm and its goals. Cast your search net wide or narrow. 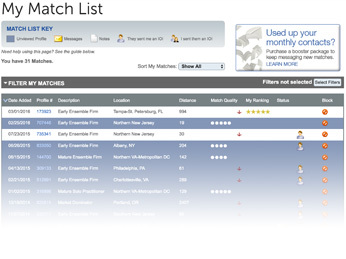 Proprietary matching algorithms identify your best matches. Refine your choices by distance, goals, custodian, and other criteria. Get your platform questions answered fast with over 35 quick videos. Identify their philosophy and culture fit. It’s like winking or poking on other social sites. Use our platform to network and start discussions. Identify yourself to a match in a private message if you choose. You have control and flexibility with your plan. As an independent RIA interested in attracting state registered advisors, I was happy to see a site where I could connect with my target audience. Since being a member, I have brought on two state-registered IAR's and successfully merged them into our practice. Currently, I am evaluating the promoted profiles section of the site and continue to look for qualified advisors who want to grow and be part of a larger firm, while still maintaining their client ownership. William Kring, CFP, AIF, Managing Partner, Chief Investment Officer, WEALTH & PENSION SERVICES GROUP, INC. I wanted to tell you how much I enjoy your service. It is a great resource for advisors looking to make changes and is one of the most valuable tools that we use. I want to let you know that I am benefiting from RIA Match. Within the first 2 weeks, I have already made contact with 2 RIAs with whom I have started some dialogue. I gladly recommend your service to other RIAs seeking to grow, sell or combine their firm with another one. RIA Match gives us the potential to acquire, merge, or partner with other like- minded firms. This is a tremendous opportunity. . . cutting edge technology allows us to virtually prospect. . . user friendly. Buyers and sellers should be on this site! I have had the opportunity to speak with a number of folks on the site and I believe it is a great tool for advisors out there. Thank you guys for creating something that was so necessary! It has been a great experience.